How important are reviews for my product? What are the two types of rank in Amazon? How can I use reviews as a way to know what to sell? Why should I track a product first before deciding to sell it? What things should I look out for to make my product better than competitors? Where can I look for a supplier for my product? If you’ve been following along, by this time you should have a nice list of product ideas to research. The next step is to log onto Amazon.com and search for each of the products in your list in order to filter out the duds and bring out the cash cows. When you conduct your search the first thing you should look for is how many reviews your potential competitors have. Why are reviews important? Glad you asked! Amazon’s rank algorithm is secret, but the general consensus is that the number of reviews a product has, has no impact on how high a product ranks on the search results­—at least not directly. Amazon rewards sales conversions; they are interested in helping consumers find what they’re looking for so they can buy it and so we can all laugh all the way to the bank. Reviews are a fantastic tool to provide social proof; all things being equal, a product with more reviews will almost always outsell a product with fewer reviews. So even though the algorithm doesn’t seem to care about the number of reviews products have, the conversion rate is directly affected by reviews—this is what Amazon cares about. Confused? Think of it this way. Let’s pretend you go to a town you’ve never been to before and you’re starving. You see two restaurants across the street from each other; one has a two cars in the parking lot and one has a full parking lot and people lined up outside. Chances are you will end up standing in line to get into the busy restaurant than risking food poisoning at the empty restaurant none of the locals eat at. The same is true with on Amazon. There are thousands of people “starving” for your product, but it is your job to make sure you look like the full restaurant, and not like the empty hole in the wall. The way to do this is through positive reviews. Once you have positive reviews you conversion rates will increase and better rankings will follow. When you’re researching your product ideas, it is recommended to look at the first 5 products that show up on the search results for the main keywords the average Joe looking for your product would type in. If all of the top 5 results have over 300 reviews, I would highly recommend you pass on this. Competition will be tough to beat. If you see that at least a couple of the top 5 products have less than 300 reviews, then you might be able to stake your claim on this market. It’s important to emphasize that it is not the reviews what’s giving them the ranking; reviews are merely an indication of the number of sales. To compete with these products, it’s not just a matter of getting more reviews than they have, but actually being able to sell more units. While you’re conducting your research your goal should be to find products with low BSR (which indicates frequent sales) and a low number of reviews. These products are what dreams are made of. Going through this research process should help you narrow down your list of ideas even further. The products you have left in your list when you’re done are the ones you can start tracking for stable performance. The importance of tracking your product candidates with tools such as CamelCamelCamel is that there are instances in which BSR could be skewed. You might encounter a product with good BSR and low reviews, but this could be just an indication of a new product that is being promoted (probably at a heavy discount). If you track the product’s performance for a week or two, you will get a better sense of its true potential. Now a week has gone by and the product you’ve been tracking is holding strong; the BSR is between 1,000 and 5,000, the product has less than 300 reviews, it’s all looking good and the product is not owned and/or being sold by Amazon. Congratulations, looks like you may have a winner! Now it’s time to look really deep and see what this competitor is doing so we can model the good stuff and fix the bad stuff. Check why they’re doing well. Does it look like a quality product? Are the photos of high quality? Do they have good lighting? What stands out to you? What looks bad and should be fixed? Look at their product name. Are they using keywords in the title? Do they have keywords in the bullet points? Is the listing fully optimized? Answering these questions will help you dramatically improve upon what your competitors are doing, and will allow you to improve the odds of having a successful product in your hands. 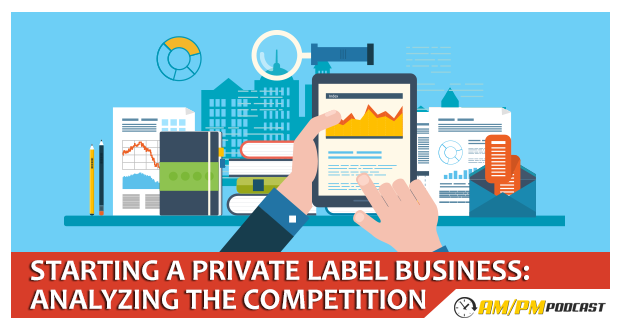 Now we need to determine if we can get the product sourced at a price where you can compete. In the next episode we’ll go over how you can source your products inexpensively and quickly, so stay tuned! Don’t forget to subscribe to the podcast and join the conversation in our Facebook community.